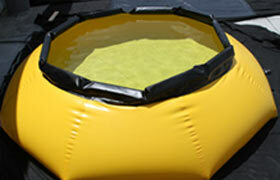 Onion containment pools are self-rising units that are ideal for emergency response situations and spill containment. Tanks are designed in a self-rising design, meaning these units will rise on their own as they fill with water. 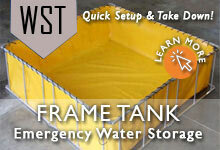 This creates a hassle-free containment tank that requires no additional support during use. This page displays our standard secondary containment sizes. If you are looking for a specific dimensions that is not listed here, please don't hesitate to ask! Custom sizes are available. In addition to these pop up containment tanks, we also offer a wide range of secondary containment products to help with the containment of both large and small leaks or materials. Drive Through Berms: Flatter than the decon pools, these berms are constructed from a flat liner and surrounding walls to effectly contain liquids. Due to their elongated exterior, these berms are often used underneath trailers, vehicles, and machinery. Models include aluminum angle berms, foam wall berms and drive through options.